The Swedes play Doom. Straight up. No frills. Doom. Heavy on the groove. Light on the leads. But the tone is spot on. “Black Magic Circle” resonates heaviness. Jacob’s lungs have more than enough power and range to hold his own. “Secrets of Your Soul” simply follows with the same slow swagger. Jacob again embellishes with gusto. But there is already an encroaching sense that perhaps the band relies too much on his impressive vocal acrobatics to the extent that it threatens to dull the impact. “Mercenary Bay” is my favourite song. Infectious hooks, throbbing bass lines and pounding percussion are capped with a golden lead break and classy vocals. All perfectly attuned and possibly no coincidence that this is also the shortest composition included bar one. “For Madmen Only” is another pounding hymn. Quite long and safe, it could be stripped back although the instrumental passage four minutes in is another hidden highlight. The second half of the album rarely strays from the formula. “Impossible” presents another subtle shift away from the frontman yet there is no merit in retracing earlier footfall and rumbling on well beyond seven minutes. “Devil’s Daughter” is racier albeit somewhat frivolous and lacking that killer blow. Then whilst the tone of “In the World…” is rather menacing, the song and album end abruptly. There is a sense of flat disorientation. Is that it? 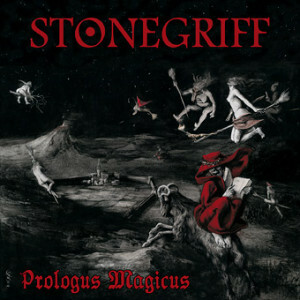 There is no denying the potential of Stonegriff if they could only spruce up the songwriting dynamics. Standing alone, any particular song can be quite enjoyable. By and large though, they are too homogeneous. The record lacks shape. Rise and fall. They do not necessarily need a second guitarist to liven it up. Listen to Blood Farmers, Ogre or fellow label mates Mortalicum for power trio excellence in 2014. The fact that they have two to four albums each under their belts is very telling alongside this debut. The point is Doom need not plod and groove indefinitely into the grave. Inject a little speed or light and shade to heighten the highs and lower the lows. It may sound harsh. But it’s not the spirit intended. No, Stonegriff has potential. With a little more daring, they could go further.